Note 1: Wow, it's been some time since I blogged about movies! Note 2: I think I am a little late with this post. It won 5 Oscars today, including 3 of the big ones. But I watched this movie only yesterday. In the recent times, the movies I have felt about very strongly have rarely won the Best film at the Oscars, like 'Black Swan' (2010), 'Inglourious Basterds' (2009), or 'The Dark Knight' (2008). This year was different. Before I go into the movie, let me tell you an anecdote. So, there was a small kid, who loved Biryani. He had a few favorite places though, where the Biryani you get, he thought, was nothing like the mediocre stuff you get elsewhere. Often, his grandfather, knowing his love for Biryani, took him to one of his favorite joints, and together they had a nice time out. There was one thing that annoyed him though, that his grandfather would always complain that the Biryani they make today is nothing like what they used to have "in his times". Then one day, his grandfather took him to this really old and small place tucked away in the corner of nowhere, and there, from the first bite of the Biryani that he took, to the point when he just couldn't have another morsel, the kid truly understood what his grandfather had meant all along. What he had just experienced was legend, and myth. 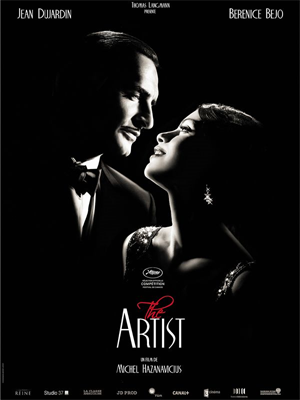 You will be aware every minute of the 100 minutes that 'The Artist' runs, of how romantically this film has been made. It is like the director is speaking to a lost love from a different era. And this, has very subtly been personified in the movie. This is what will stand out for me from the movie - Love. It portrays a different kind of love, distilled into its truest and purest form. The kind that isn't maligned with the selfish emotion of man. The kind that fills your heart with such warmth that you walk out of the theater with a big smile and feeling all fuzzy inside. The scenes have been crafted with such perfection that you wonder if the director is really a magician. You applaud the details that have gone into painting every frame like it was a piece of historic art on the canvas, and the parallels that the movie has to offer. The specific scene where George Valentin discovers that he is still silent in a world that has begun to talk is a masterpiece. Or the scene where even his shadow abandons him. Or towards the end, when the movie literally ends with a 'Bang!'. Story-wise, it is gratifying that what happens on screen is what you expect to happen (in a restoring-faith-into-humanity sort of way). The film succeeds on so many different levels, and considering that the film hardly had any words, that it is ironic how no number of words would be enough to describe the genius that this movie is. It even makes sense if you draw parallels with the state of contemporary cinema, where the major production houses have decided that "3D is the next big thing", and that "you will be left behind if you don't jump ships." Or man's path towards self-destruction. Or of melting pride and arrogance. I can understand if people would want to pass this movie - a black-and-white silent film, shot in 4:3 aspect ratio, with a lower framerate. Therefore, I strongly urge that you watch this film. It is a gem which, to watch in a theater is a privilege, and is the kind that succeeds in re-kindling the sublime romance that has been lost.